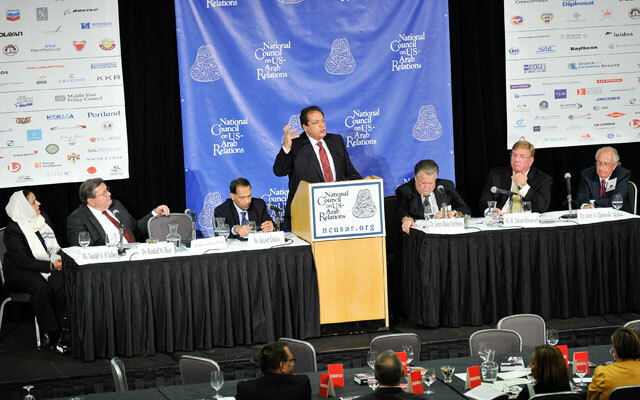 On March 29, 2017, the National Council on U.S.-Arab Relations, the Middle East Council of American Chambers of Commerce, Willkie Farr & Gallagher LLP, and the U.S.-GCC Corporate Cooperation Committee hosted a public affairs briefing on “The Future of U.S.-GCC Trade and Investment” in Washington, DC. Featured specialists included Dr. John Duke Anthony, Mr. H. Delano Roosevelt, Mr. Christopher Johnson, Ms. Nahlah Al-Jubeir, Mr. Robert Hager, Mr. Mike Jones, and Dr. Karl Petrick. A podcast of the event can be found below as well as in iTunes along with recordings of other National Council programs: http://bit.ly/itunes-ncusar. Session on Arab-U.S. Business, Education, and Healthcare Cooperation with Dr. John A. Ulatowski, Mr. Khush Choksy, Ms. Nahlah A. Al-Jubeir, Dr. Randall W. Burt, Mr. Mohamed Abo Elenin, and Mr. H. Delano Roosevelt from the National Council on U.S.-Arab Relations’ 24th Annual Arab-US Policymakers’ Conference, “U.S.-Arab Relations at a Crossroads: What Paths Forward?,” on October 15, 2015, in Washington, DC. Washington, DC: The National Council on U.S.-Arab Relations, founded in 1983, is pleased to announce that H. Delano Roosevelt has joined its International Advisory Committee. In announcing the appointment, Council Founding President and CEO Dr. John Duke Anthony said, “We are delighted that Mr. Roosevelt recognizes the value of the Council’s U.S.-Arab relations leadership development and bridge-building educational efforts. We’re especially pleased that he has agreed to serve on the Council’s International Advisory Committee. Given his decades of serving on the front lines of promoting the U.S. relationship with the Arab world, there’s no question that we will benefit from his guidance and extraordinary insight.” The Council’s International Advisory Committee does not formally govern the organization, but instead makes recommendations and provides strategic support and advice to the Council’s board of directors, and its president and chief executive officer. 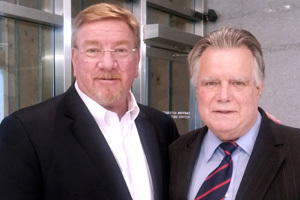 (Right to Left) National Council Founding President & CEO Dr. John Duke Anthony with Council International Advisory Committee Member H. Delano Roosevelt. Delano Roosevelt is currently the Director of New Business Development for the Reza Investment Group based in Saudi Arabia. He was a co-founder of Friends of Saudi Arabia, a non-profit group dedicated to promoting awareness of Saudi Arabian culture and society, with HRH Prince Abdulaziz Bin Abdullah, a son of the late-King Abdullah. Mr. Roosevelt is also Chairman of the Middle East Council of American Chambers of Commerce, a Member of the Board of Directors of the American Chamber of Commerce in Bahrain, and a Member of the Executive Board of the American Business Group of the Eastern Province. The historic meeting between the two heads of state – these two distinguished Advisory Committee Members’ grandparents – took place aboard the U.S.S. Quincy in the Great Bitter Lake of the Suez Canal on February 14, 1945. Ever since, the bonds forged between Saudi Arabia and the United States then are regarded as having laid the cornerstone of a relationship that has done far more than benefit the two countries and their respective peoples. Indeed, the relationship is one that has arguably benefitted the entire world and been a source of envy in the eyes of all who would emulate it if but they could. About the National Council on U.S.-Arab Relations: Founded in 1983 and based in Washington, DC, the National Council is an American non-profit, non-governmental, educational organization dedicated to improving American knowledge and understanding of the Arab world. Information about the Council’s program, projects, events, and activities can be found at ncusar.org.